The eighth UK-China Education Summit saw the signing of 23 education agreements to further collaboration and increase student mobility, which UK Minister for Universities and Science Jo Johnson said signalled a “new phase of scientific and educational collaboration on an unprecedented scale” between the two countries. China's Minister of Education UK, Yuan Guiren, and UK Minister for Universities and Science Jo Johnson signed a ‘UK-China Strategic Framework in Education’ agreement at the UK-China Education Summit. The summit took place as part of the UK-China High-Level People-to-People Dialogue in London last week, culminating in the signing of a ‘UK-China Strategic Framework in Education’ agreement that laid out the two countries’ commitment to expanding collaboration across higher, vocational and school education, and to work closely together in sports education. “Our agreement will bring researchers together to address global challenges, change the lives of young people through better access to sports, and build partnerships across school, vocational and higher education to provide students in both countries with the right skills to become the leaders of the future,” Johnson said. Speaking at a forum on UK-China innovation and entrepreneurship during the event, Vice-Premier of China Liu Yangong stressed the importance of deepening research collaboration to tackle global challenges. She also encouraged the development of joint training through exchanges between universities, research and business, as well as establishing joint science infrastructures and sharing facilities and information. The dialogue is expected to form the basis for increased partnership activity between the British Council, Association of Colleges and China Education Association for International Exchange across apprenticeships, employer engagement, curriculum development and leadership training. It builds on collaboration that has helped to establish 60 college partnerships so far. During the summit, the British Council and CEAIE signed a memorandum of understanding to link 200 schools in the UK and China to facilitate exchange visits and policy and curriculum development, focussing on STEM subjects, language, sports, arts and other creative subjects. They also signed an MoU to launch a joint academic-internship programme in China as part of the Generation UK-China programme, to be piloted in Beijing, Shanghai and Qingdao. “Education collaboration between the UK and China is vital if we are to learn from each other’s successes and to help us use international evidence of best practice to drive up academic standards in our schools,” commented UK Schools Minister Nick Gibb. Among the HE agreements signed, Cardiff University and Beijing Normal University further cemented their partnership, announced last year, to establish a joint college in Cardiff offering undergraduate programmes taught in Chinese – the first of its kind in the UK. And as China pushes to grow its sports sector, agreements in sports education included the development of a joint football accreditation system, enabling Chinese football coaches to train in the UK. 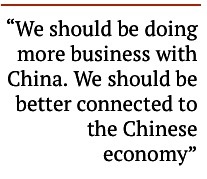 The dialogue was held ahead of Chancellor of the Exchequer George Osborne’s trade mission to China this week, during which he said he wants the UK to be “China’s best partner in the west”.